This Friday, June 21st, marks the Summer Solstice. This week has started off with lots of rain and wind in New York City, barely giving me the feeling that Summer is around the corner, and culminating in involuntary personal hairdids that would give even Beyonce’s best teased wig a run for its money! Oh, but it is near, the promise of warmth, sunshine, heat, A/C, heart openings, cool refreshing drinks, and social gatherings! And this is a great time for heart connection – expression, talking, emoting, feeling, hugging, and kissing! We hug and kiss loved ones, family members, friends, partners, even acquaintances, as a sign of affection. It is a global practice that spans cultures, despite language barriers. We need it as children, to feel truly connected to others in our world; and as adults, these practices demonstrate and express care, heart-centeredness, joy, and intimacy on various levels. The touch of loved ones increases hemoglobin in the blood, which helps our body increase oxygen flow throughout the body, including the heart and brain. Increased hemoglobin helps speed the healing process after illness. Kissing increases the levels of oxytocin, an extremely calming hormone that produces a feeling of peace. It can lower blood pressure, reduce your heart rate, increase nerve activity, and release endorphins, creating more upbeat moods. Hugging can help build a good immune system, decrease the risk of heart disease, and decrease levels of the stress hormone cortisol in women. Kissing improves our immunity by releasing antibodies that kill bacteria. And kissing helps us prevent cavities by increasing saliva that washes our teeth. It has also been shown that our saliva secretes natural antibiotics when we kiss. According to the American Psychosomatic Society, a hug or 10 minutes of holding hands with a romantic partner can help reduce stress, and its harmful physical effects. What Does “Raising My Vibration” Mean? When we do anything uplifting to our spirit, it helps us create more positivity in our lives, and promotes happiness or a sense of peace, we are participating in the practice of “Raising Our Vibration”. It is something we create when we watch, read, or listen to something inspirational, cleanse and hydrate ourselves by drinking lots of water, when we meditate, sing, play, receive an Acupuncture or Reiki treatment, practice random acts of kindness and/or mindfulness, and when we eat vibrant, alive, organic, grass-fed foods that nourish us. In addition, when we truly and openly hug or kiss from a heart-centered level, not only do we receive the health benefits listed in the factoids, above, but we also raise each other’s vibrations through positive energetic transfer! How easy and accessible is that! Where to find it: On the midline of the sternum (breastbone), technically, in a depression level with the junction of the 4th intercostal space and the sternum. Why this point rocks: When we give a full on hug, you activate your huggee’s Ren 17, and they activate yours. This happens to be the front gathering point of Qi for the Pericardium (our Heart Protector), the Point of the Sea of Qi, the Meeting point of Qi, and is the meeting point between the Conception vessel with the Spleen, Kidney, Small Intestine and Sanjiao channels. With all those titles, what exactly does it mean? Let’s just say it helps you breath better, since it addresses shortness of breath, obstructions in the chest (like asthma, coughing), helps bring your chest some juicy Qi so you have the energy to speak, breathe with ease, and can even help digestion! Where to find them: They cover the entire back! Why these points rock: Back Shu points are where the Qi collects for specific organs on the back of the body. And, yes, I’m talking a lot of organs, since it covers your entire back! So depending on the embrace, you could be tonifying your Lungs, Heart, Liver, Spleen, or other organ! Where to find them: PC 8 is a Pericardium point, located in the palm of the hand, between the second and third metacarpal bones. HT 8 is a Heart point, located in the palm of the hand’s fourth and fifth metacarpal bones. Where to find it: Above the chin, in the depression in the center of the mentolabial groove (“mentolabial groove” is fancy talk for the area where some people have a cleft line in their chin). Why this point rocks: It extinguishes wind (in Chinese Medicine, that means things like hemiplegia, deviation of the mouth, lockjaw), benefits the face (pain, numbness, and swelling), and regulates the Conception vessel, which means it is helpful with lower abdominal issues in men and women. In this case, epilepsy and mania-depression. In one text, it, “Deals with one’s ability to appreciate one’s own resources – one’s Yin”. Where to find it: On the midline, at the junction of the margin of the upper lip and the little divet/philtrum (the tippy top of the upper lip, in the middle of the “bow” of the lip). Why this point rocks: It calms the spirit and benefits the mouth, and can even help with nasal congestion. It helps with manic psychosis, epilepsy, and lockjaw. Where to find it: The little divet (or philtrum) above the upper lip, technically at the junction of the upper third and lower two thirds of the philtrum. Why this point rocks: It restores consciousness and calms the spirit. You can actually apply your thumbnail to it when someone faints to revive consciousness. It also benefits the spine and can treat acute lumbar sprain (although there may be stronger points that address this kind of pain.) As a Ghost Point, it treats mental disorders. In one text, it treats “disorientation towards the world”. Wow, that’s a pretty hefty benefit from kissing this acupuncture point! Is it a coincidence that so many Ghost Points are activated when we hug and kiss, hence addressing mental disturbance, free flow of chest Qi, and calming the spirit? Methinks not. You are literally treating yourself to good health every time you hug and kiss! 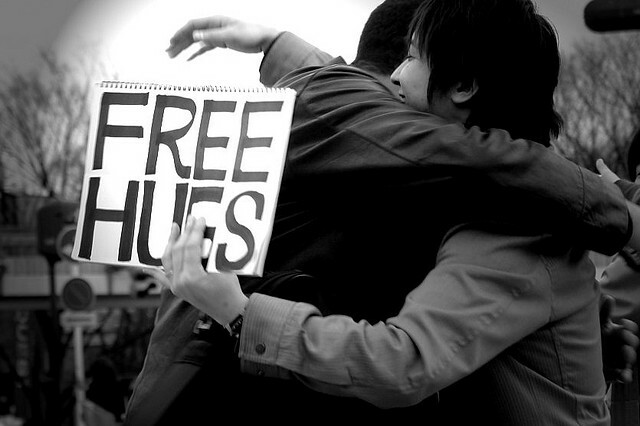 Do you notice that your mood or health improves after a good hug or kiss?